If you're looking to capture high-quality audio whilst filming, or want to have a high-quality field recorder always at the ready, the iXY is a winning solution. Excellent audio quality. Compact and cost-effective (assuming, of course, that you already own an iPhone). 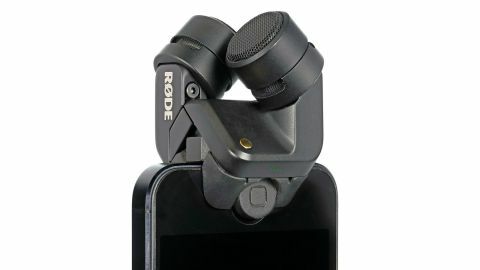 The Rode iXY Lightning is an extremely compact stereo microphone for recording via Apple mobile devices, offering a 'locked' X-Y recording configuration at sample rates up to 96kHz and resolution of 24-bit. "The recorded results are rich, high-quality and hugely impressive"
The condenser microphones are matched 1⁄2-inch cardioid capsules, borrowing from Rode's long experience in microphone design. The recorded results are rich, high-quality and hugely impressive. Once clipped to your phone, recordings are most easily made to one of Rode's own 'Rode Rec' apps, available either in full or basic 'LE' forms. A high-pass filter is offered to reduce handling noise, whilst recording level is controlled via the software. Also in the box you'll find a protective case (with belt strap) and a basic wind-shield. Further accessories, including mounts/grips, are available from Rode.